The Gabriel floral wedding crown is a statement piece from the Secret Garden collection that beautifully captures the essence of an enchanted garden bursting with botanical details. This full halo layered with muted tones of soft ivory and antique silver tones exudes wild ethereal blooms with luxurious bohemian appeal. Magical and rhythmic, the Gabriel will delight with its unexpected details, mesmerising floral accents and shimmering Swarovski details. Decidedly feminine and with modern chic appeal, the Gabriel crown is an heirloom piece that you’ll love to pass on. *LIMITED QUANTITIES – Due to the popularity of the Gabriel crown, we have limited materials available to create this design. If you love this crown, we recommend you secure it before we are no longer able to recreate it. The Gabriel floral wedding crown is made to order. Please allow 4-6 weeks for production plus delivery times. Perfect for those looking to create an unexpected and effortless styling statement, the Gabriel crown is a modern take on a traditional tiara or crown with bohemian luxe appeal. The Gabriel can be worn with or without a wedding veil. 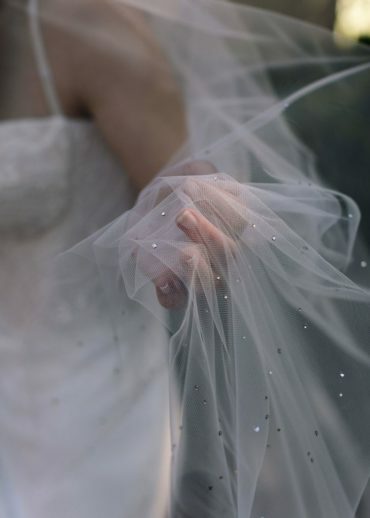 We love to offer our brides the ability to easily remove their veil after the ceremony and continue wearing their halo for the evening celebrations. It’s a flexible metal piece that can be curved to the contours of your bridal hairstyle. 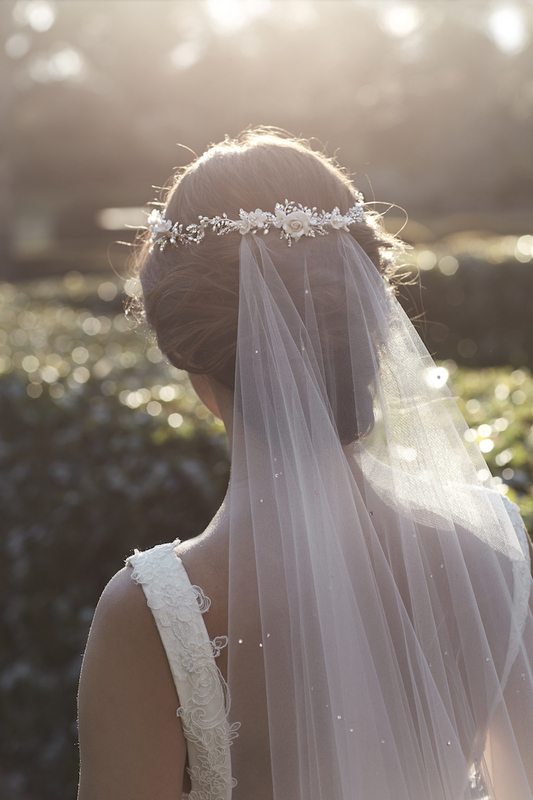 Pair the Gabriel halo with the Etoile or Margaux veils for a touch of sparkle. For a more a classic look, the Rosella, Dahlia or Marais veils fit perfectly underneath this headpiece. Browse our full veil collection or contact us and we’d be happy to offer a recommendation to suit the Gabriel based on your wedding dress and hairstyle.